Purchase the book from Amazon or get the Kindle Edition here! 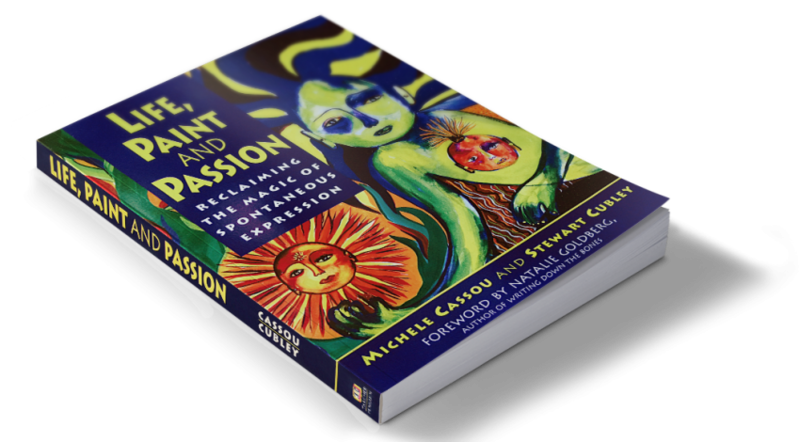 Read what author Natalie Goldberg says about The Painting Experience in her Forward to Life, Paint and Passion below. “It is our hope that as the chapters unfold, you will discover a growing excitement about painting, an instinctual urge to play with color and form as you did when you were a child. Play is one of the most basic and primitive elements of the human psyche, and ultimately art is simply a deep and essential play. You are Lucky if You Don’t Know How to Paint! “I have learned much about painting from Stewart and Michell. But learning is not limited to the physical act of applying paint to paper. Through The Painting Experience, I have located crannies of resistance in my mind and opened them up. I’ve been freed from concepts of inadequacy, from limiting opinions of what’s beautiful, from censoring emotions and desires. At one point I bolted from the workshop to finish writing a chapter that had been giving me much difficulty and was suddenly revealed as my brush stroked the paper. In working with Stewart and Michell, I found I had to give up my idea of what a painting should be: portraying a beautiful scene in a pleasing way. Instead, it is about the alive act of moment-by-moment listening to the flashes of thought at the periphery of perception, and responding in color and form. They taught me what I knew to be true in writing but now had to learn in another medium: that creativity is a process, that it takes practice and intuition, that it is full of surprise and discovery and cannot be known ahead of time. This book is an extended deep meditation on what it means to be alive and to express one’s true being. It is about mining the uncensored self, that part of us that is our life’s blood, the true foundation of creativity. I am moved by the writing, which is full of urgency and dedication; Michell and Stewart want share what they know. And they know a lot! This book is thorough, detailed, and leaves no aspect of the force of inspiration and vision untouched. I almost envy them their medium—painting seems so delicious, lush, exuberant. Color seems the gateway to the place where words falter.